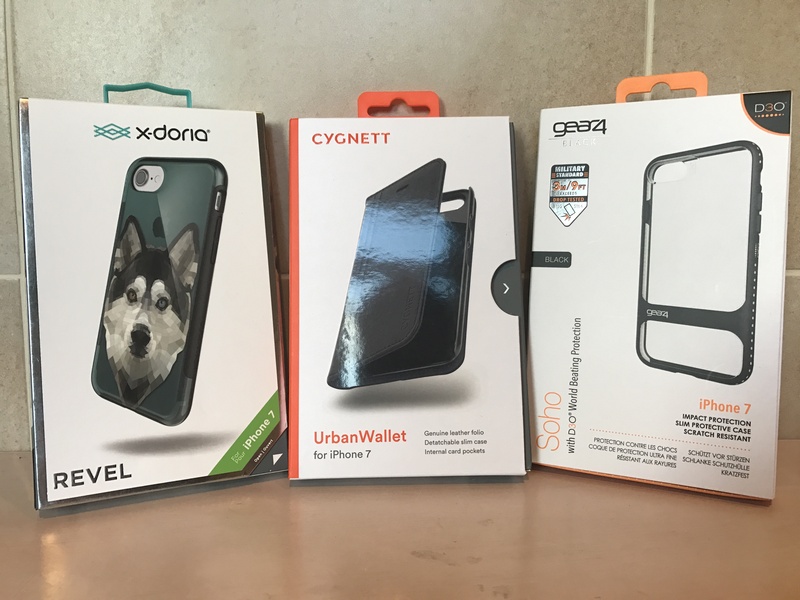 Recently we received a selection of cases for the iPhone 7 and since I have been dubbed the sites’ “iPhone guy”, it fell to me to discover the merits of each. The sample that arrived was the Cygnett Urban Wallet, the x-doria Revel and the gear4 Soho. Cases are a very subjective item, so this will be entirely based on my opinion. If I was to part with my hard earned pennies on one of these, which one would I choose? Time for a head to head shootout methinks. All 3 arrived in rather swanky packaging, with slide out trays, flip up cover and magnets galore. There was plenty of information clearly displayed and all conveyed a sense of quality. No real winner so far. I’m not sure how I feel about extravagant packaging. On one hand, it adds confidence that you are getting a quality product, but on the other, saving a few quid on a more functional box could drop the price. I love the idea of the Cygnett. It’s a walled design, but the actual case is held in the wallet with magnets, meaning that you have the option of running your phone in a simple case if you were mounting the case in your car for example and then simply clip it into the wallet for pocket carry. I love the versatility of it. Once in the wallet, the lap is held closed with another magnet. The x-doria is a sleek and simple case. It’s constructed of a translucent rubbery plastic and has very useful rubberised grippy panels down each side for traction in sweaty mitts. The Revel offers a number of colours and pictures on the case so you can pick the one most applicable to you. t fits very snugly on the phone so t doesn’t alter the profile too much. The gear4 Soho is again a fairly simple design with a clear plastic backing and a rubberised surround. Gear4 claim that the case meets military drop standards of 3m/9ft and I could believe it. The case fits the phone well and there is a good amount of squishiness (apologies for getting too technical) which would certainly help absorb impacts. Whilst I love the idea of a removable wallet, the magnets on the Cygnett aren’t super strong and I would be concerned that they are the only thing holding my precious phone in place. The actual case offers little in the way of protection. It looks pretty but the sides do not sit proud of the screen so there is no protective bezel and no impact defence when it’s outside the wallet. The x-doria is simple in design so offers a sort of midway point between protection and low profile. There is a slight raised bezel, but it’s so small that if you have a glass screen protector, it will sit flush. The grippy surround definitely adds to the traction, but it is very rigid and, given how tightly this case fits, there is little impact protection. The gear4 has a transparent case and we all know what that means. After a while, it’s going to look like frosted glass as it shows every scuff and scratch. Also if you are in the habit of tucking the odd item behind the case – password notes, emergency cash, metal panels for magnetic mounts, etc forget it. and finally, whilst offering the best protection of the 3, it’s also the chunkiest. So who gets my cash? This is actually quite a tough decision as, despite my nitpicking, I do actually like all 3 of these cases. So this comes purely down to personal preference. I think I will have to discount the Cygnett simply because of the confidence, or lack thereof. I’m sure my phone would be more than safe in it, but I just can’t get passed the thought that its al just held together with some small magnets and that’s asking a fair bit of trust. I really like the x-doria. I wasn’t familiar with the Californian based company, but I checked their site and some of their other cases look really impressive particularly their more rugged ones. The Revel I got is blue with a picture of a Husky on it, which is nice if you are into Huskies, but It doesn’t do much for me personally. Now if the Revel (minus the husky) were to fit into the Cygnett wallet (and they made the magnets stronger), that could be really something appealing. My personal tastes run towards the more protective cases and gear4 Soho, whilst it doesn’t appear as a rugged case, certainly inspires some confidence. Add a decent screen protector and you are good to go. As the winner, I carried this case in my pocket for a couple of weeks and was actually surprised to note that the transparent plastic has held up rather well and looks almost good as new. Yes, the fact that you can see the metal plate which I use to attach it to the (super strong) magnetic holder in my car is visible, but it’s a black panel on a black phone, so it’s not a deal breaker. So the winner for me is the gear4 Soho. It’s certainly not perfect, but in this shootout, it came closest to the bullseye.